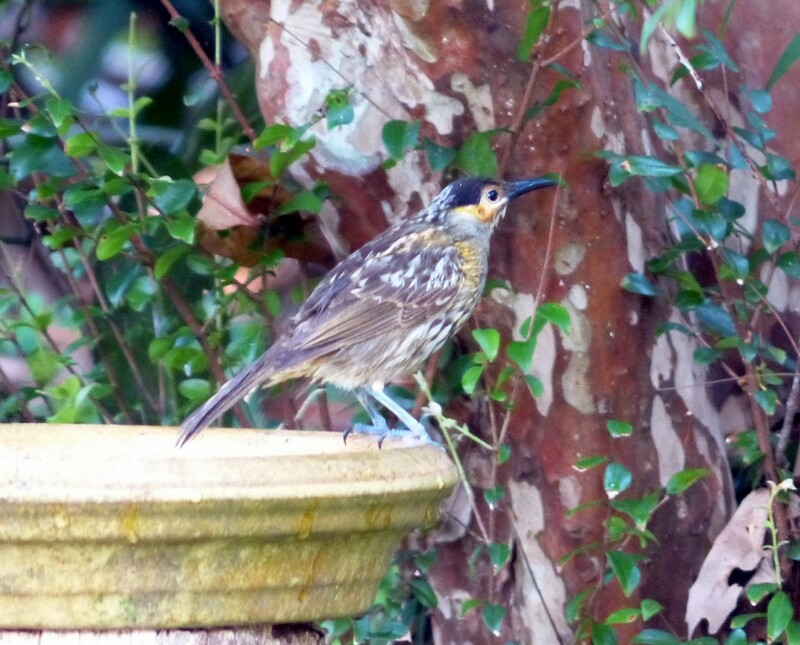 I have managed to take a better photo of the Macleay’s Honeyeater – its not perfect but I am improving! The birds enjoy our well sheltered bird baths but it does make photography more challenging in the low light. 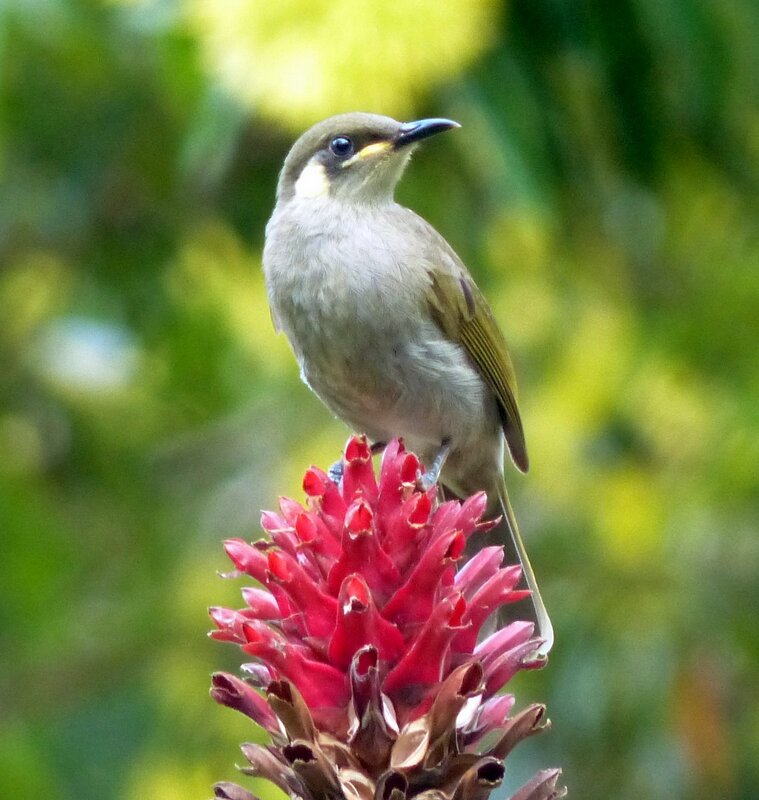 Victoria’s Riflebirds have been seen feeding all about the property recently, all those sighted (so far) have been female or immature birds and most commonly eating fruit of the Bleeding Heart tree, Homalanthus populifolius. 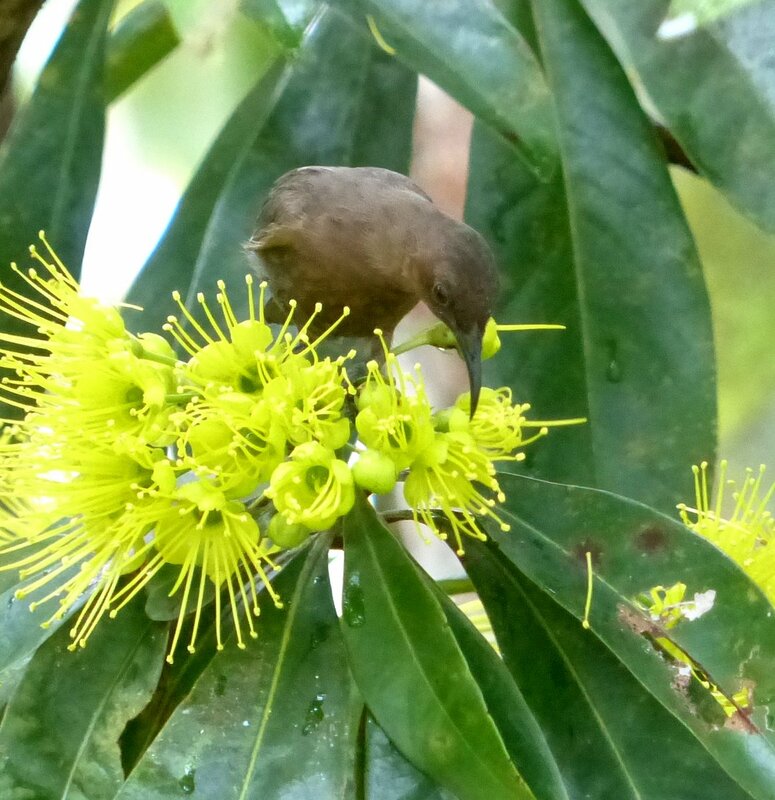 However, we have also watched a Victoria’s Riflebird feeding on the fruit of the native Costus, Costus potierae, which we have planted in our house garden. Yellow-spotted Honeyeaters have also been eating the Costus fruit, so this plant is not only an attractive ornamental but a useful food plant for the birds. 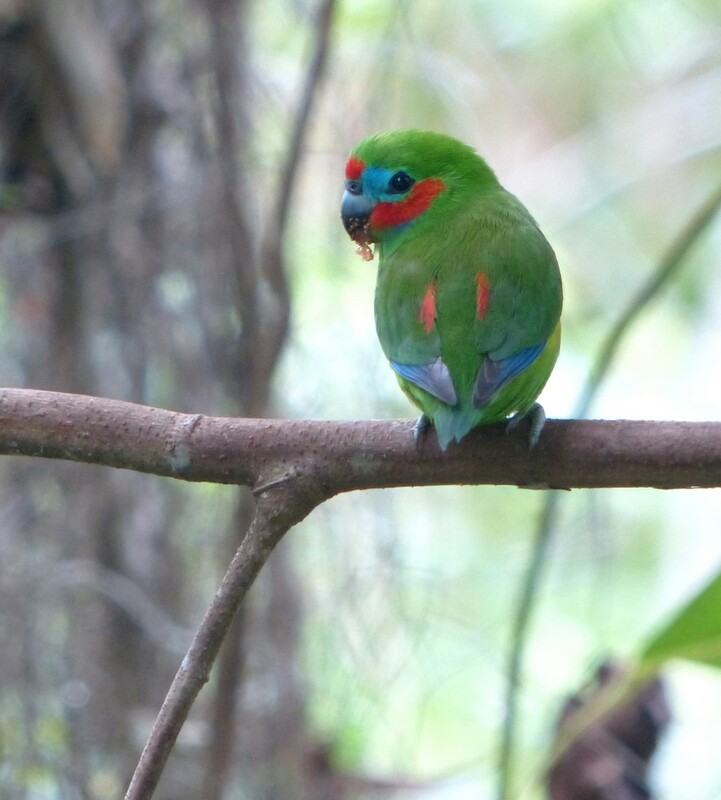 This male Double-eyed Fig Parrot was sitting on a branch close to my vegetable garden. 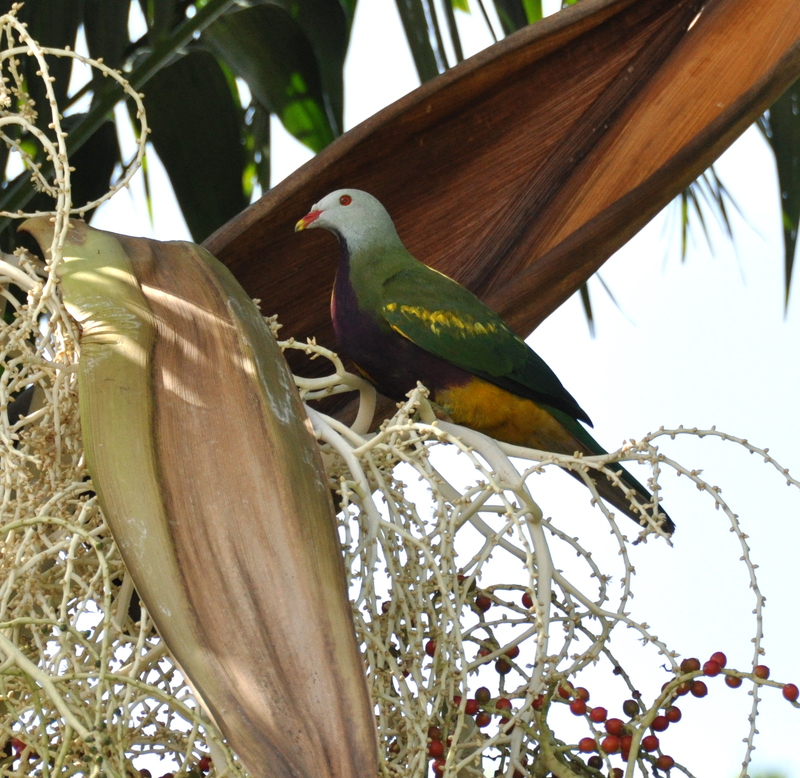 It had been feeding on the fruit of Red-leaf Fig, Ficus congesta. Double-eyed Fig Parrot race macleayana, male. While this particular tree had obviously been visited by a number of fruit eating birds, it is not often the fruit of choice. Many times we see the fruit quite untouched when other, more desirable, fruit is in abundance. Red-leaf Figs are common pioneer species in areas of regenerating rainforest and provide a reliable source of food at times when the fruit of preferred species is unavailable. Red-leaf Fig, Ficus congesta. 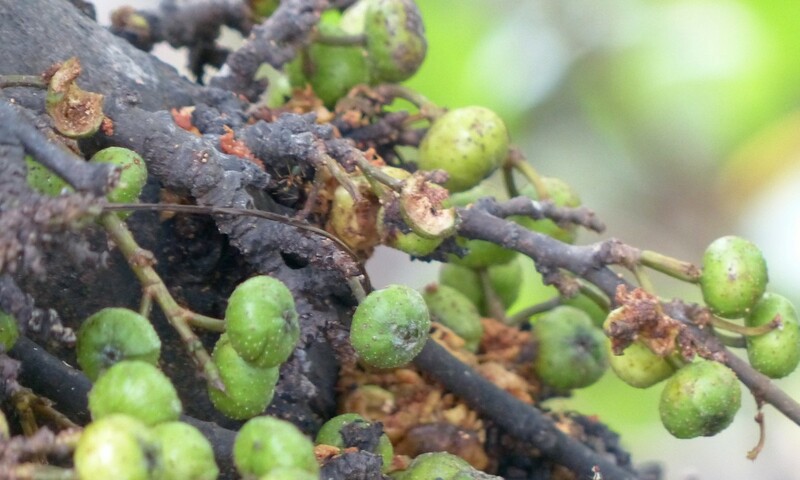 Detail of fruit on tree trunk. After several different ‘poses’ on the branch this gorgeous little parrot stretched his jaw open wide, probably necessary after much processing of the tiny fig seed, although I confess it did look to me like a yawn. And then he moved up higher in the tree out of sight and our photo session was over. So much colour outside our kitchen window! 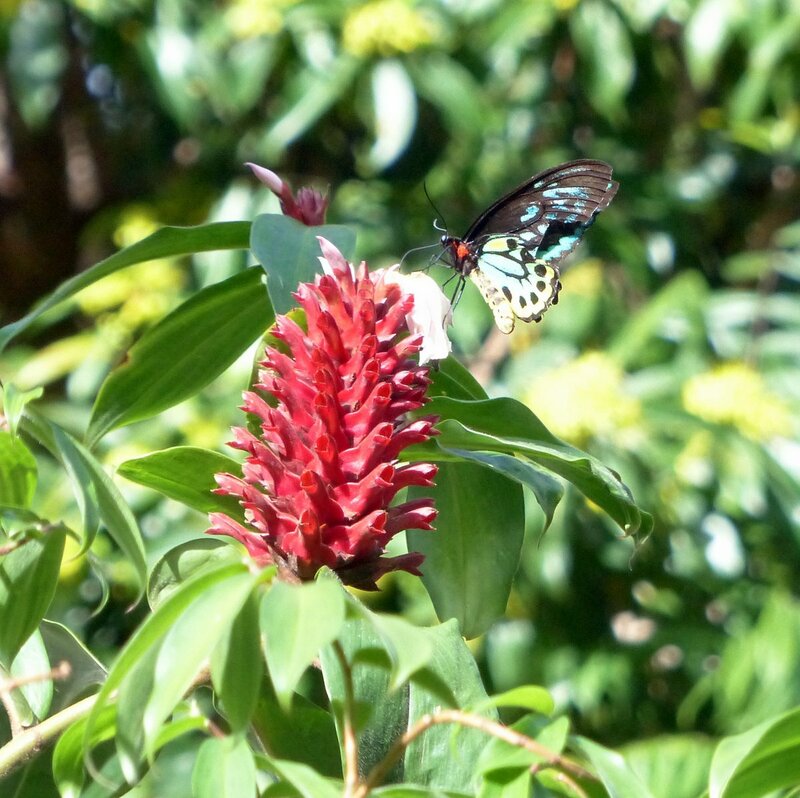 After what seems like a long wet season,we are not the only ones enjoying some sunny days and our garden is busy with many birds and butterflies. Golden Penda, (Xanthostemon chrysanthus) is a very popular ornamental native species which has been extensively planted in our region and it is now flowering prolifically, leaving a carpet of golden yellow stamens lying on the ground beneath each tree. 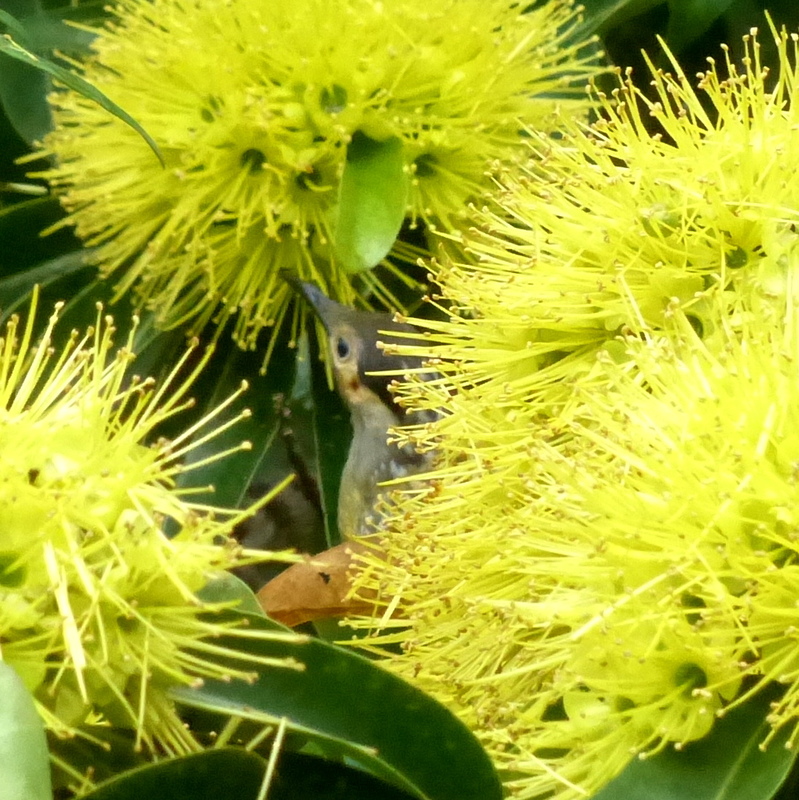 Macleay’s Honeyeater – the eye only just visible in the flowers. Its a wonderful time of the year to be out in the garden, not too hot and there is lots to do but also much to gaze at and I’ve dashed back to the house for my camera on several occasions. The Macleay’s Honeyeater just won’t stop for moment in its feeding frenzy so I’ve had lots of trouble getting a shot that is even partially in focus. The flower in these photos is a native Costus (Costus potierae) which looks very similar to the exotic Costus speciosus but can be identified from the latter by the hairy upper leaf surface. Costus potierae can be found in Cape York, some of the Torres St Islands and N E Queensland but it only occurs very close to sea level. 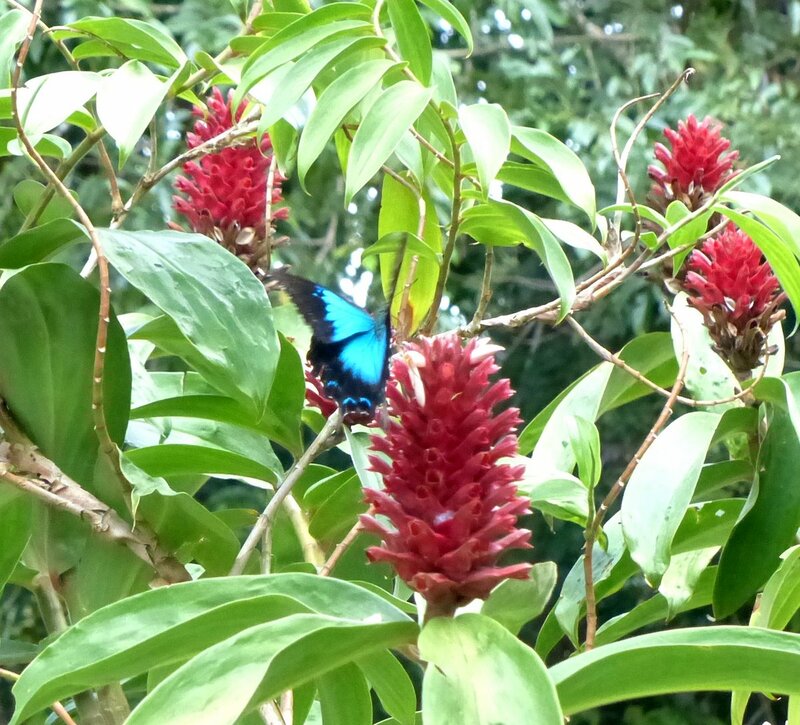 The white flowers attract many butterflies and small birds while the beautiful red bracts provide a brilliant colour accent amongst the verdant garden foliage. The flashes of blue from several Ulysses flying around is impossible to capture in a still photo – this splash of blue gives the general idea. Yellow-spotted Honeyeaters are probably our most commonly sighted bird species and I was delighted that this one posed so nicely while deciding on where to fly next. and the source of the rotting flesh smell. 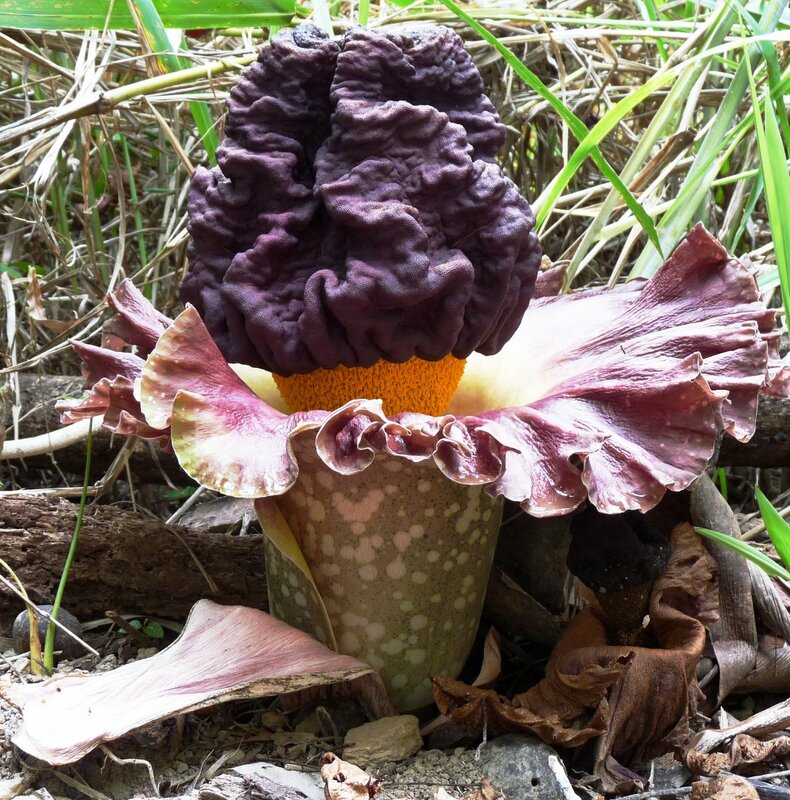 Amorphophallus paeoniifolius, known as Stink Lily or Elephant foot yam is in the Aroid family (Araceae) and is found from India to New Guinea and in the far northern parts of Queensland. Apparently the flower not only exudes this unusual aroma but also gives off heat – this information was given to us a few days later by some botanist friends when the flower had passed its peak. 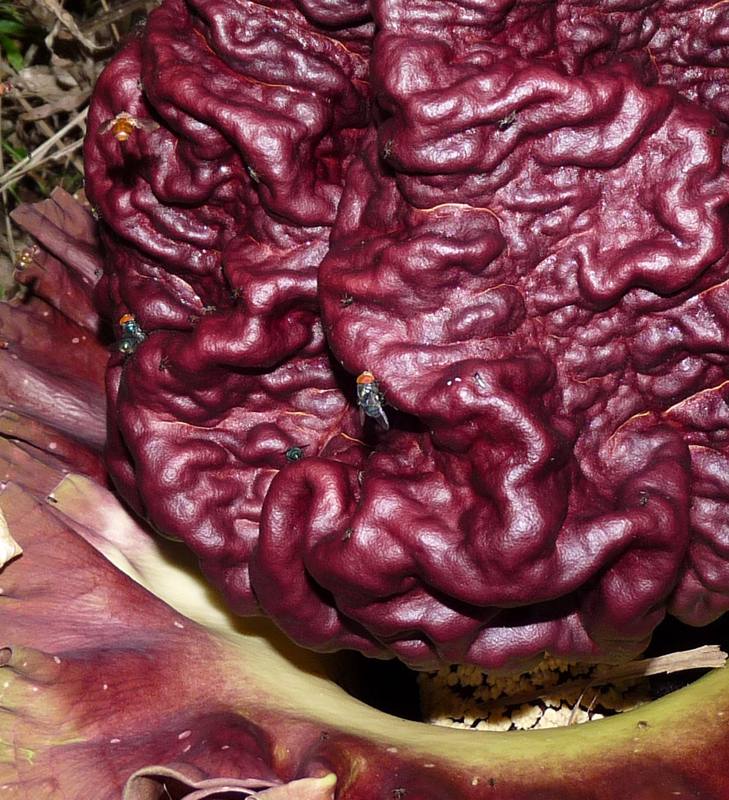 The flowers are on a spadix which is under the bulbous knob, just visible in the bottom right-hand corner of this photo. 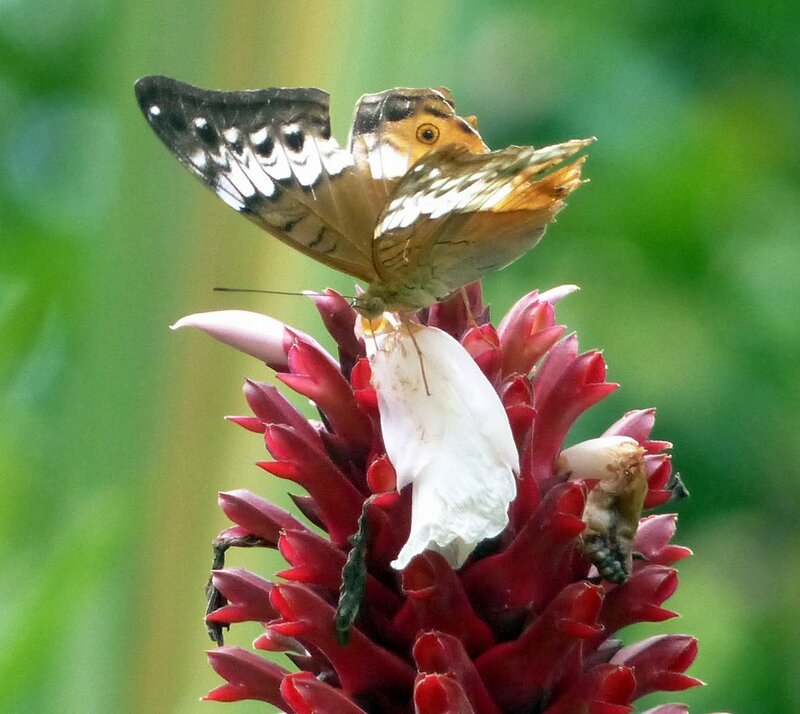 They are pollinated by carrion flies and beetles and although flies were certainly attracted, in this case pollination does not appear to have taken place. July 6th Two days later – the spadix has pushed up a bit further and it is possible to see the male and female flowers. The bulbous top has lost its sheen and looks slightly shriveled – and the flies seem to have lost interest. The smell only lasts a few hours so although it is extraordinarily pervasive it is only short-lived. 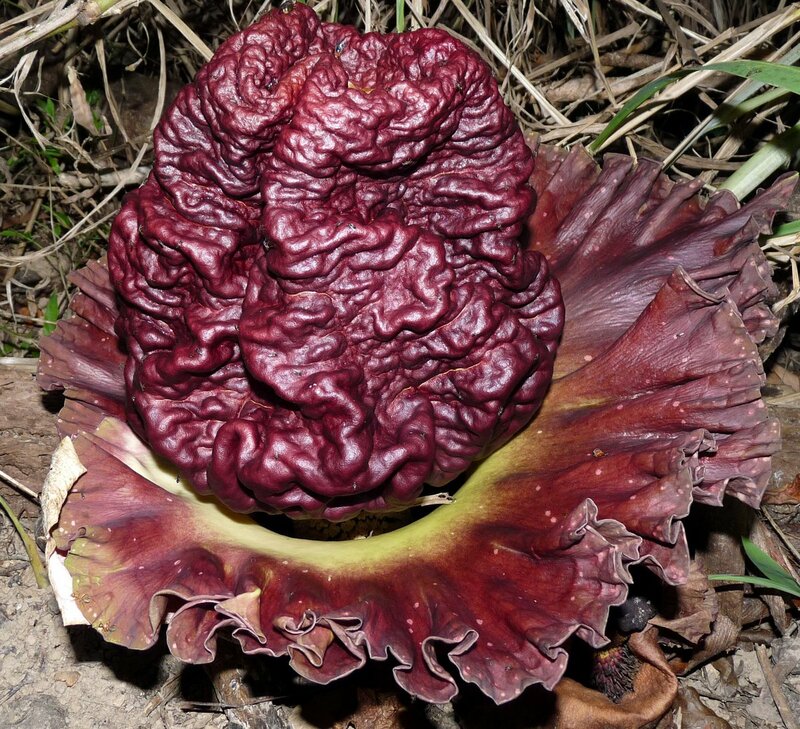 The bulbous top looks its best for about 24 hours while the spathe continues to look decorative for several days but today Nov 12th the entire flower remains are shriveled and brown. Amorphophallus paeoniifolius has Peony-like foliage as described by the species name. The single leaf is borne on a mottled stem after the flower has died. The production of the leaf uses most of the starch stored in the corm – the plant produces a new corm after the leaf has wilted and died. The corms of some varieties are edible and grown as food crops in several Asian countries. I am not about to dig our one plant up and consume the corm, we grow Taro in our vegetable patch which is a much better addition to vegetable curries. 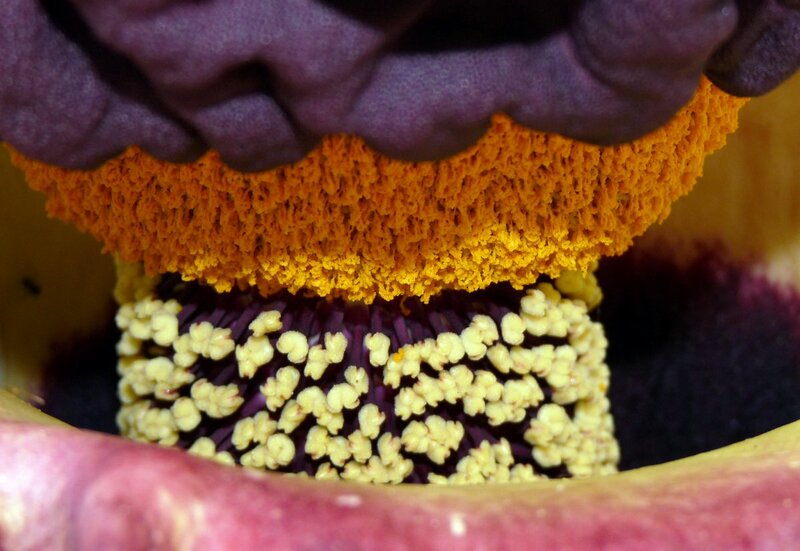 Although it certainly resembles a fungus and is sometimes referred to as ‘fungus root’ this flowering plant belongs in the family Balanophoraceae and is found in Queensland’s moist rainforests. Not frequently observed as they are often partially covered by leaf litter on the rainforest floor, this unusual plant is a leafless root parasite needing no chlorophyll. Leaves have been replaced by scales and each plant consists of a single stem about 8 cm high. Male and female flowers are produced separately on the plant. 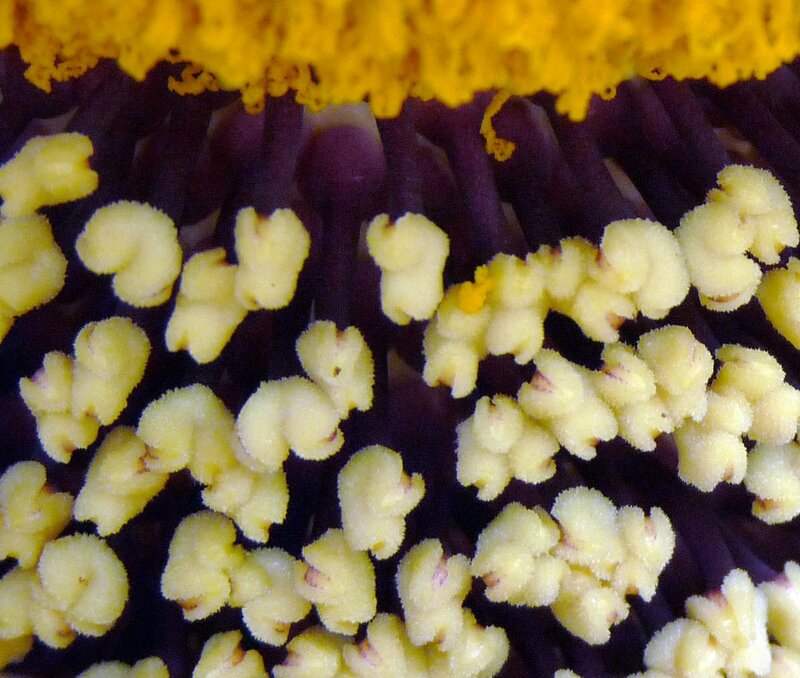 The male flowers encircle the stem below the club shaped organ which is covered in tiny female flowers. 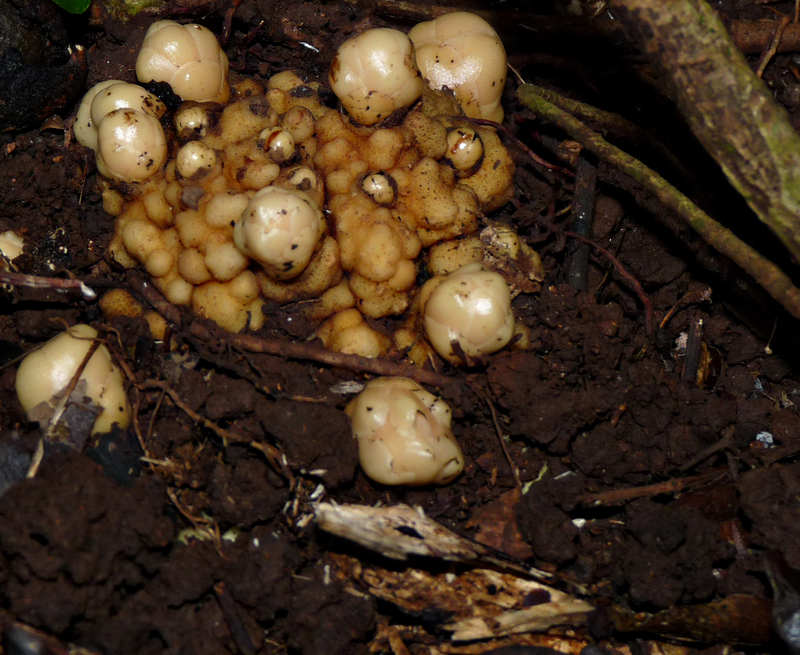 The tiny fruit are numerous and cover the club-shaped receptacle. Once the plant has fruited it collapses, much as fungi do. 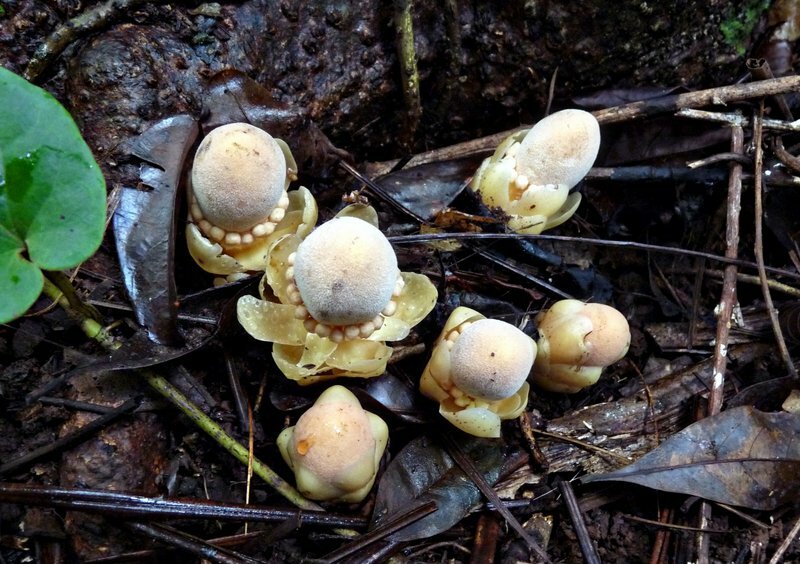 In the last photo you can see new stems emerging from their underground tuber while the collapsed fruiting body appears as a dark brown mass which merges into the rainforest floor and could be easily overlooked. References: “Fruits of the Australian Tropical Rainforest” W&WT Cooper; “Native Plants Queensland” Keith A.W.Williams; “Amongst Trees” R.Russell et al. The weather conditions have been as expected for this time of the year – hot and humid. Some days it seems more extreme than I remember but probably I’m just using the weather as an excuse to only work outside for a relatively short time in the morning. Another update on Spotted Whistling Ducks: when we had some heavy rain for a few days the Wandering Whistling ducks departed along with the large flock of Magpie Geese which had descended upon us. Our resident Magpie Geese are still here and one suspects they may be rather relieved that peace has been restored. 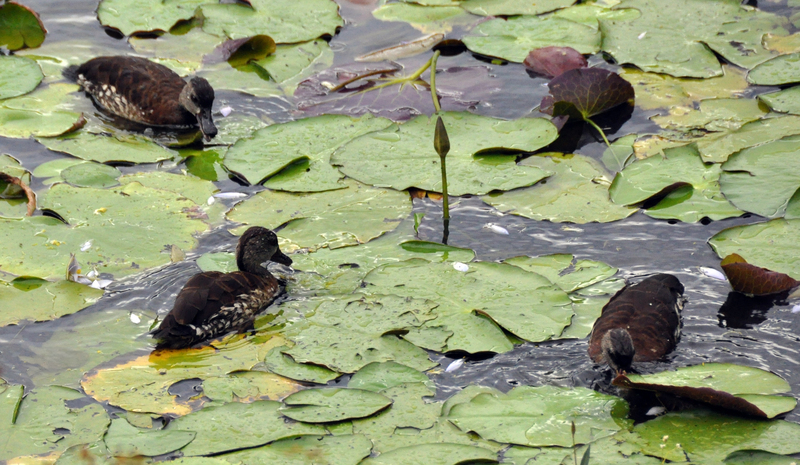 The Spotted Whistling Ducks stayed for a day or so longer but then for nearly a week we didn’t see them anywhere. 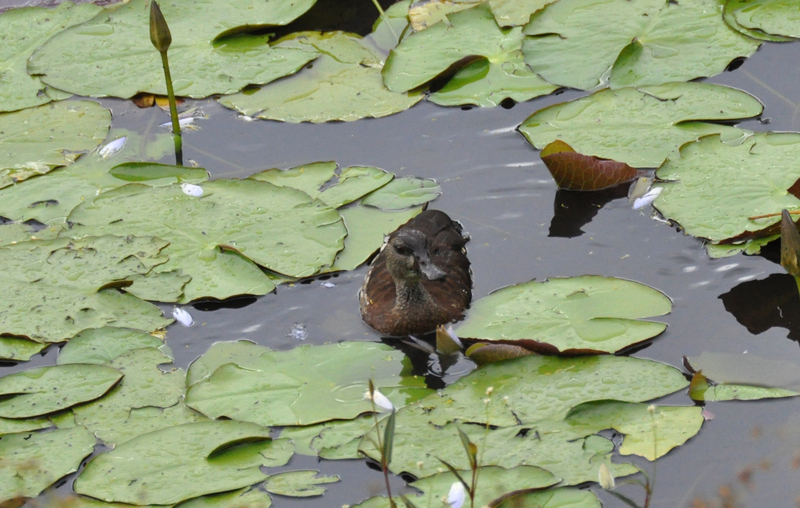 However, they are now visiting again and have been trying out all our ponds, we can see where they’ve been by the remnant pieces of water weed, Vallisneria, and shredded water lily flowers! They actively feed through the heat of the day both on the water surface and diving, staying underwater for 15 – 20 seconds. After a period in the water individuals will fly to a suitable horizontal branch, or in some cases a perching post, where they busily preen and dry off before returning to the water for further feeding. 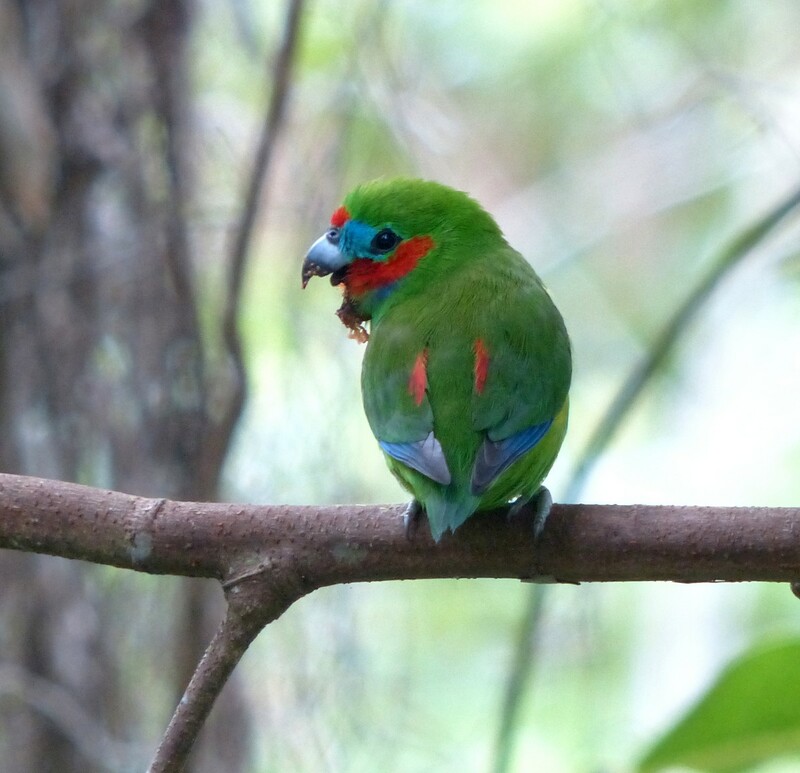 There have been flocks of Double-eyed Fig Parrots feeding on Glochidion, commonly known as Cheese Tree, and we have also observed them feeding in Melaleuca cajuputi. These paperbarks provide food and shelter for many birds, insects and fruit bats and we’re pleased that much of our swampy areas that were cleared of paperbarks in the early 1900’s are gradually returning to useful habitat. This week the Melaleucas have started flowering, the event was announced by a loud humming sound accompanied by the sweet, nectar laden scent. An Azure Kingfisher flew past Allen yesterday with a fish in its bill and two younger birds following behind; a Little Kingfisher used one of our perching posts as a take-off point for fishing and Black Bitterns are frequently disturbed at the spillways both here and at our neighbour’s place, we estimate at least three regulars are moving between the two properties. 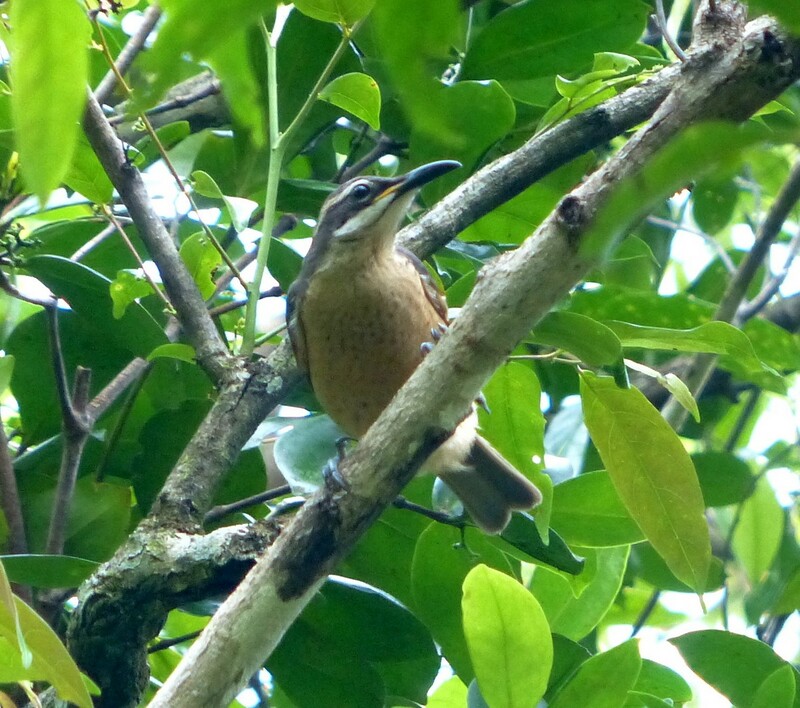 We suspect Shining Flycatchers are nesting again but haven’t yet confirmed this. They are quieter than a couple of weeks ago when we watched some amazing displays from two males competing for a female’s attention as they went through their repertoire of calls. Spangled Drongos have, once again, successfully harassed a Great-billed Heron until it flew back to the creek. I confess it is a little disappointing as it would be rather fun to have more regular visits from this majestic bird but I can’t blame it for leaving as the Drongos are very persistent in their attacks. So we’ve been enjoying the birds this month as we make the most of the sunny mornings and mostly fine ‘though cloudy afternoons – it looks like rain is heading our way. 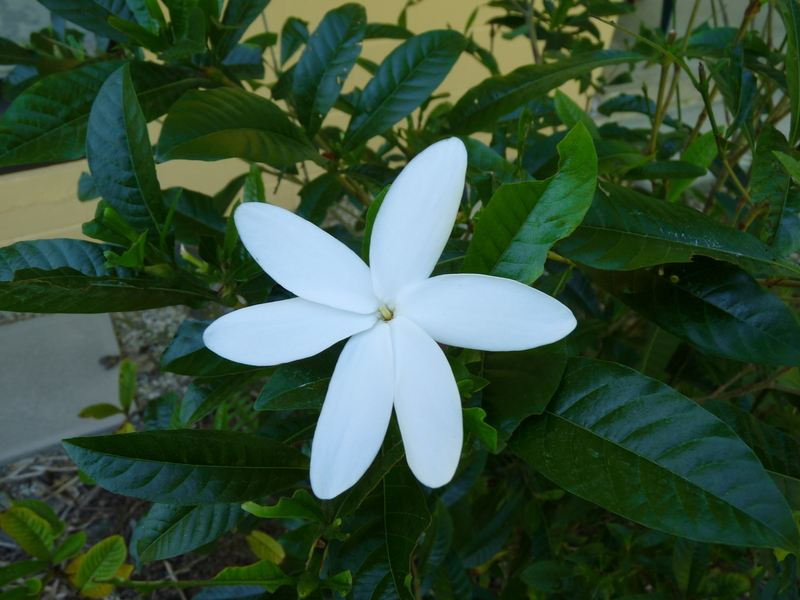 Although we have already posted some information on Gardenia actinocarpa there is a follow-up story……………..
We have two plants growing in tubs on our verandah, so that we can maximize our enjoyment of their delightfully intense perfume. The two verandah plants both produce only female flowers. Both our plants continually set seed which surprised us as they are the only Gardenia actinocarpa growing on the property. So where did the male pollen grains come from? At first we thought that perhaps the seed would be infertile. However, we were able to germinate a few seed and we grew a couple of very healthy, sturdy plants that eventually flowered themselves – beautiful white flowers which have a lovely perfume, not quite as intense as the female parent but the flowers are dramatically larger with a 90mm diameter when fully opened. There are occasions during the year, especially the wet season, when the green shades of the tropical rainforest are broken only by occasional bursts of colourful new growth. 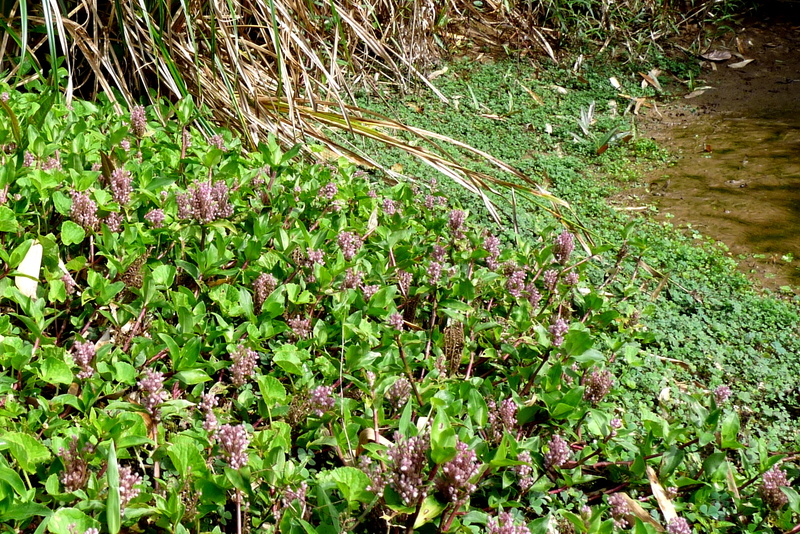 However, in the past few months we have been enjoying many colourful flowers – I was very pleased to find such a healthy Floscopa scandens covering the newly exposed muddy bank of this little pond; I planted it here about two years ago but it has taken a while to become established. 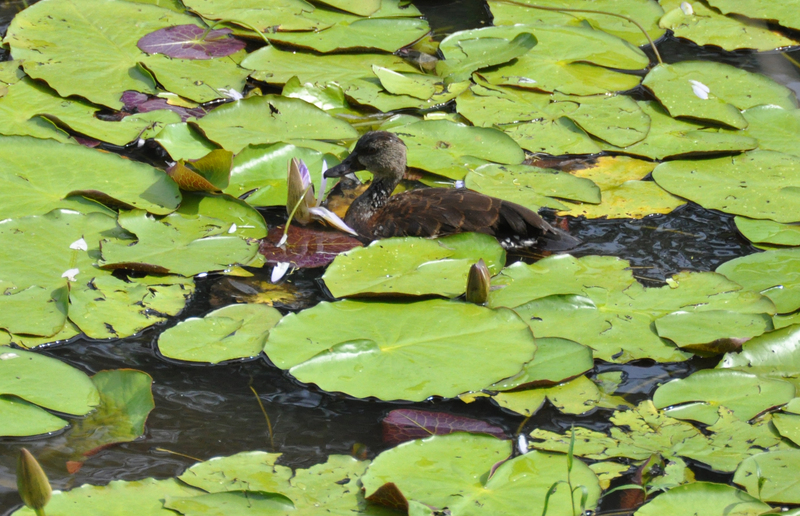 The bottom of the pond is covered in Marsilea mutica, an aquatic or terrestrial fern. Allen wrote about Floscopa here so I won’t repeat his words. No word from us for weeks but we are still here! The weather has been fine and sunny and we’ve been very busy with lots of different jobs. Last week I thought about writing a blog entitled ‘perspectives’ as I pondered the many hours I have recently spent removing a vine called Scindapsus aurea (Devil’s Ivy) from the gully below our rental cottage that Allen is currently renovating. Photography has been quite a challenge recently – poor light conditions as well as an exceedingly damp atmosphere. Last week I thought I might have to test my abilities to write some descriptive prose without the benefit of colour illustrations. However, luckily we have had a couple of sunny days …………………. 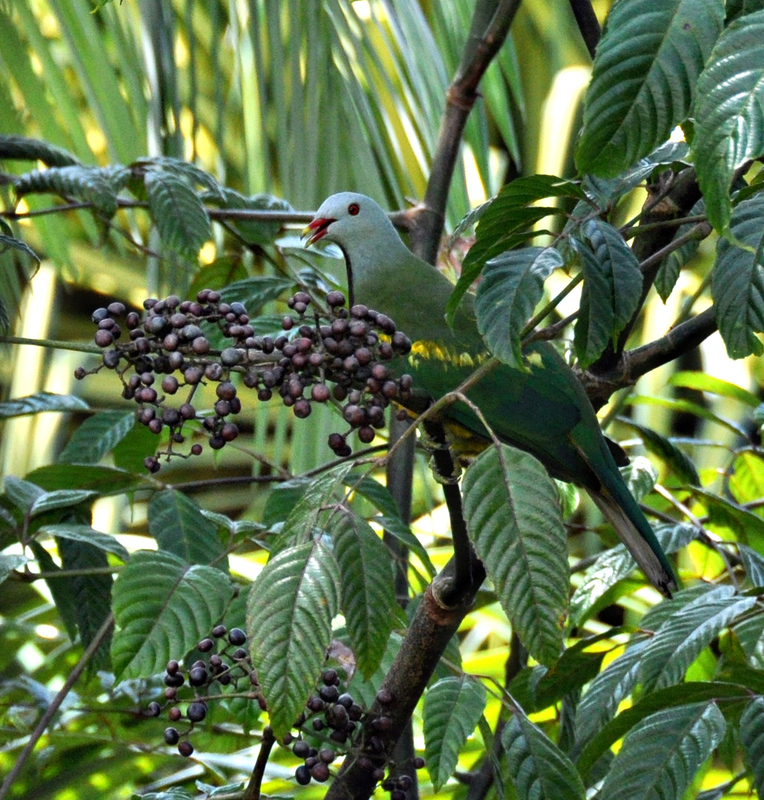 The first photo shows a Wompoo Fruit-dove (Ptilinopus magnificus) eating the fruit of a Bandicoot Berry (Leea indica) which just happens to be growing not far from our verandah. From this angle, in the subdued afternoon light, you can see how the Wompoo blends so well into its environment but in the next shot this gorgeous plump pigeon is displaying its rich purple chest and golden yellow underparts. Wompoos have a variety of strange calls, their common name is somewhat descriptive of a call one often hears in the forest but when they are feeding we mostly hear ‘puck, puck’ which triggers our response to race for the camera! Flowering Fern indeed. 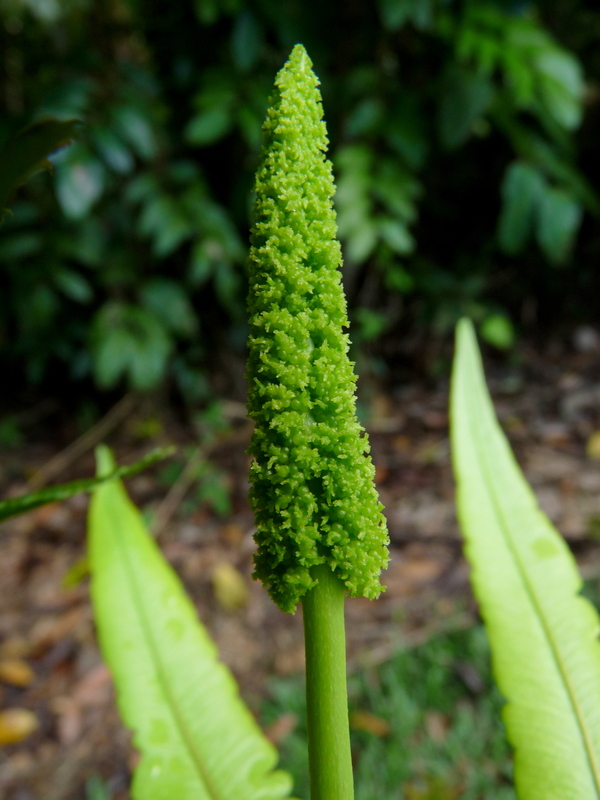 The common name of this primitive fern is confusing, ferns do not flower, however the spike that they produce is certainly quite flower-like. This fern belongs to a monotypic (only the one member) Genus Helminthostachys, which is known to occur throughout South-east Asia. In Malaysia it is eaten as a vegetable. The plant extends into North Australia from the Kimberley to the Daintree. I’ve generally seen this plant growing in fairly boggy places so it must prefer a bit of a wet patch. To be honest the first time I saw this plant in the wild I did a double take. I saw it from a bit of a distance and was quite sure I was looking at a fern but couldn’t quite get my head around the bit that was sticking up. The family,Ophioglossaceae, to which this plant belongs is quite small, having a mere 70 species in 4 Genera. Of these only about 10 occur in Australia within 3 Genera. 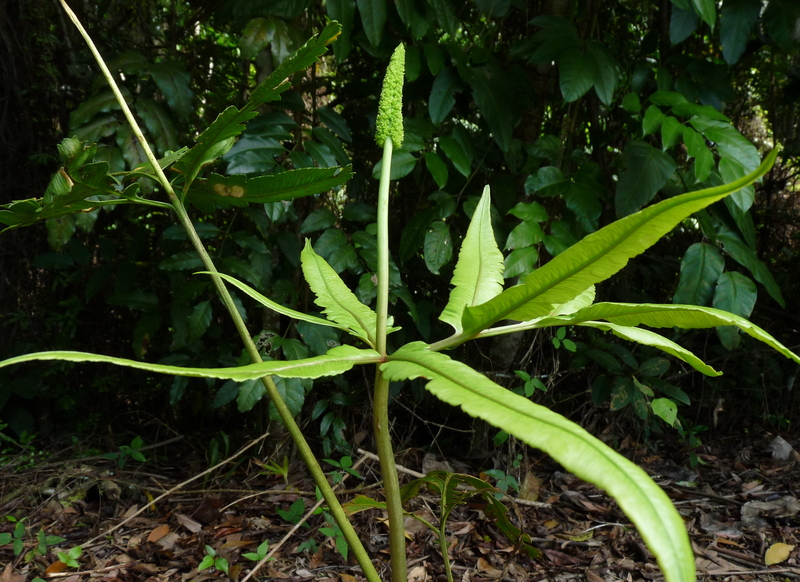 One of the other local members of the family is Ribbon Fern, Ophioglossum pendulum, which unlike the terrestrial Flowering Fern live as an epiphyte. 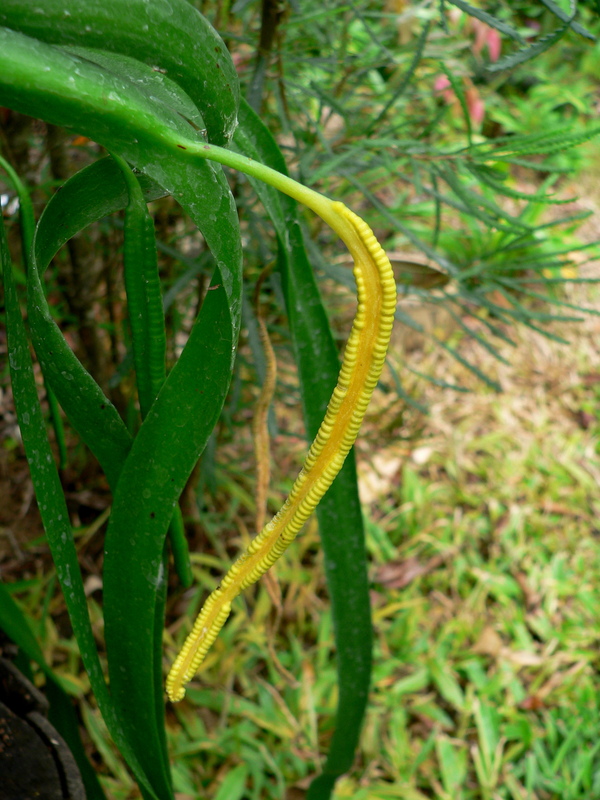 The fronds, which are ribbon-like, can be up to 1 m long and tend to twist some and hang down. Like the Flowering Fern they have an unusual spore producing appendage that develops out of the frond.